As we wrap up the week, let’s do it in style with the return of the Dueling Review. 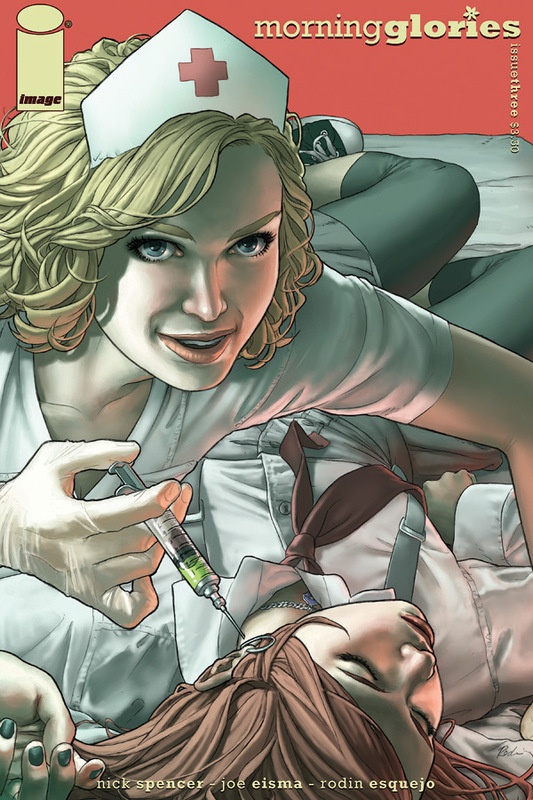 Morning Glories from Image Comics has been heating up the charts, selling out again, and again, and now with issue three, it’s time for Matthew and Stephen to weigh in. Previously in Morning Glories: Gifted teens are given the chance of a lifetime to learn at the Morning Glory Academy. While many have gone on to be incredibly successful, there is something odd – not right about the school. The latest group or recruits is discovering that all is not as cracked up to be, as they are each brainwashed and tortured in an attempt to break their will. The strongest, Casey, is having the toughest time adjusting, as she’s discovered her parents have been murdered and her classmate attempted to kill herself in the process. STEPHEN: Crappit! This is one of the most intense series I’ve read in a while, and while the last two issues, may have pushed the limits on physical and mental abuse, this issue turns the mythos to the supernatural side, by introducing readers to a mantra that has been building for the last 600 years. STEPHEN: There’s an interesting parallel storytelling method going on here, as Casey is trying to learn to calm down in order to get her way, while her friend, Jade, discovers the academy is more than willing to experiment, and quite possibly kill those that don’t live up to the school’s expectations. I like the thriller aspect of the story – the will she, or won’t she aspect works well in this installment that already has me jacked up on the weirdness that is going on. We’ll have to wait until next month to find out what happens to Jade, but I predict that she’s going to return to class as another model student. MATTHEW: Yes. Yes, you are. And as for violence against children, these are teenagers, whom I’ve hated ever since I was one. Remind me to tell you about the days when Otter Disaster worked at an arcade in the mall and the putzy little punks who came in. Bygones… I don’t think that the expectation is that Casey is smarter than any generation that came before, or that her partners are better, more that we may have finally found the correct balance of attributes (Casey’s leadership, Irwin’s snark, the one kid’s karate, Freddy’s cool van, Daphne’s money, Velma’s brains and Shaggy’s unlimited weed stash) to serve as the key to whatever lock needs opening… What’s your take on the picture side of the equation? STEPHEN: I continue to really like the art by Eisma. The composition is good, and the figure modeling is alright. The thing that doesn’t seem to sit quite right with the art is the shading. Characters seem to have a lot more light on them than the background, like they are perpetually standing in a glamorous lighting situation. MATTHEW: I have to say, I was disappointed to find that the cover artist wasn’t the interior guy, because the covers of this book are PHENOMENAL in their beauty. That said, the interior work is excellent as well. Eisma gives us teens who look like teens but are still believable as comic protagonists, which is a hard balance to strike given the general exaggeration of physiques in the industry, and his faces are amazing. The sheer malice in the face of the school nurse was worth the price of admission for the issue. STEPHEN: For me, this series continues to draw me in, and I find myself continuing to be drawn each issue after issue. I really want to see what happens next, and providing the creative team can deliver up more mystery, while at the same time giving us answers (something LOST completely didn’t do), then this is a series I’ll be reading for as long as Image continues to print it. 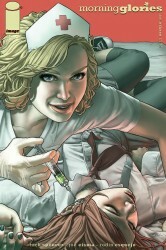 Morning Glories #3 is so worth picking up, I’m giving it 4 out of 5 Stars. MATTHEW: I completely agree. After the interesting teasers got my attention, issue #1 drew me in completely, and each subsequent one has held my interest. I never watched ‘Lost’ or most of the heavy mythology television series of recent years, but I imagine that this is how viewers felt in those early episodes. Morning Glories is an intense, fascinating read from top to bottom, and issue #3 earns a damn near perfect 4.5 out of 5 stars overall. My only reservation is that last issue ended with that weird cliffhanger/flashback, something that isn’t addressed at all in this issue… Still a damn fine read, though. This is another series I’ve gotten into because of you people. Thanks. I’ve really enjoyed this series so far, but I’m still quite confused. I’m assuming that’s part of the appeal of the book too, which I get, I want to feel like there’s a good reason to go out and pick up that next book. We don’t know the score at this point. These characters aren’t like Spider-man or Savage Dragon, we don’t know if any of them are safe, or what the status quo really is, and that’s kinda fascinating. My only concern with the art is something I haven’t had much problem with I just wonder with everyone in uniform if that will pose any difficulty in telling people apart. The only time I’ve been a little confused was when Jun was flashing to why he was in detention, the guy who pulled the gun on him looked a lot like him. I think it was supposed to be the guy that the wraith-thing stuck his fingers into his brain, but I wasn’t positive. I’m in agreement with you guys too though, those covers are beautiful. I’d love a poster of the second issue’s cover if available, with all the water, it’s gorgeous. Either way, this is just another title that’s really luring me back to Image comics since way back when huge guns and double-bladed swords were on my radar. Image has a pretty winning collection of books with Walking Dead, Chew, and Morning Glories, and all three of those books are quite different from anything else on the market. I also have the Ted McKeever Library books 2 and 3 (Eddy Current and Metropol) that they released through their Shadowline imprint, and those are phenomenal, so great job Image. I’m a tough person to impress and they’re actually starting to win me back a little bit.